If you want to ensure that your vehicle starts and runs smoothly in all weather conditions, including extreme cold, synthetic oil is a great choice. It also helps to keep your engine and its components lubricated for a longer period of time than conventional oils. Finding the best synthetic oil for your vehicle means reading reviews, studying product features, and diving into the ins and outs of available blends and configurations. With the right synthetic oil, keeping your vehicle running in peak condition can become a quick, over-and-done with task. We reviewed dozens of synthetic oils to identify the best of the best, based on Amazon reviews, how well they performed in cleaning tests, cost, and other considerations. We narrowed our search down to 5 of the top-rated synthetic oils vehicle owners can purchase to ensure a smooth running ride. Meets the performance requirements of nearly all North American passenger cars. We’ve identified Valvoline SynPower 0W-20 Full Synthetic Motor Oil as the best synthetic oil out there. Since it meets the performance requirements of nearly all North American passenger cars, this synthetic oil is one that will keep your vehicle running in tip top shape. These benefits allow you to trust your vehicle will start, even on the coldest of days. 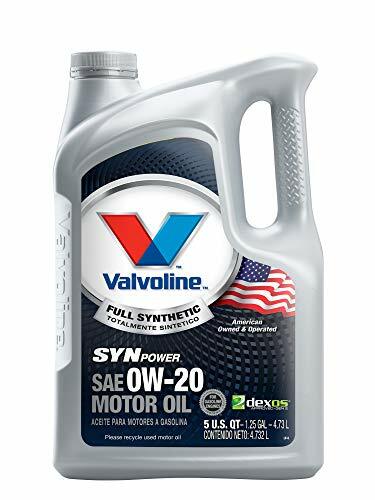 Valvoline SynPower 0W-20 Full Synthetic Motor Oil took the top spot on our list of the best synthetic oils, thanks in large part to the fact that it meets the performance requirements of nearly all North American passenger cars. This makes it a versatile choice for any driver. It is suitable for use in nearly all naturally aspirated, turbocharged, and supercharged engines, and helps to prevent sludge buildup. It offers a high level of protection under severe driving conditions in both high temperature and cold temperature settings. Those who purchased and reviewed this synthetic oil appreciated the value this oil offered for the price. People found it gave better mileage than some other synthetic oils, and even helped with improved acceleration. With a price tag of around $23/5 quarts, it’s not overly expensive, but the quality craftsmanship associated with the brand, as well as the ease of use more than justifies that price. It has a rating of 4.8 on Amazon with nearly 300 people reviewing it, which we think goes a long way in convincing vehicle owners to make the investment. Meets or exceeds the latest OEM and industry approvals. 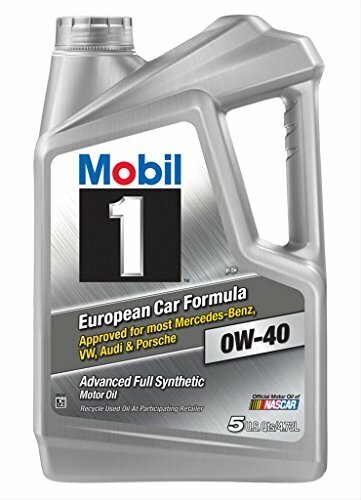 Mobil 1 120760 Synthetic Motor Oil 0W-40 took the runner-up spot on our list of the best synthetic oils, and meets or exceeds the latest OEM and industry approvals. The full synthetic formula has been approved for use in most European cars, including Mercedes-Benz, VW, Porsche, and Audi. It helps to clean dirty engines in order to provide noticeably improved performance. Those who purchased and reviewed this synthetic oil appreciated that it stood up in high performance driving situations, including extreme heat and cold. While some people found the price a bit expensive, others felt it was a good deal for a full synthetic compatible with European cars. A couple people mentioned that the container would leak if placed on its side, so be sure to store it upright. At a cost of about $39/5 quarts, it doesn’t come cheap, but the quality craftsmanship associated with the brand, as well as the ease of use more than justifies that price. It has a rating of 4.8 on Amazon with more than 600 people reviewing it, which we think goes a long way in convincing vehicle owners to make the investment. A full-synthetic motor oil in a budget-friendly package. 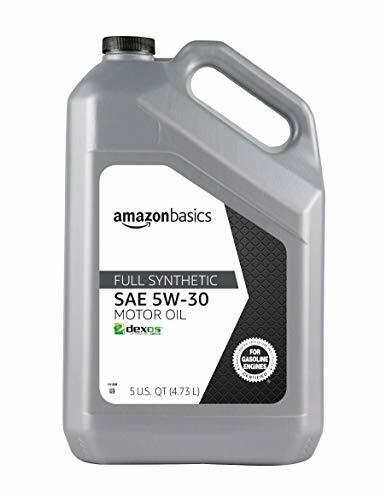 The AmazonBasics Full Synthetic Motor Oil is an excellent choice for those looking for a synthetic oil that won’t break the bank. It offers all the benefits of a full synthetic oil without the hefty price tag of some other brands. It has been specially formulated for longer drain intervals, and to help reduce friction for improved fuel economy and protection against engine wear. Those who purchased and reviewed this synthetic oil appreciated that it offered all the benefits of a brand name oil at a fraction of the cost. People liked that it still had API certifications, and were even using it on their high mileage vehicles without issue. There were a couple complaints about not having a strip to see how much oil was left in the container, which is something to keep in mind if you aren’t using the full container at once. At a cost of approximately $20/5 quarts, this synthetic oil is a solid choice for those looking for a synthetic oil option on a budget. It has a rating of 4.7 on Amazon with more than 200 people reviewing it, which we think goes a long way in convincing vehicle owners that this budget-friendly pick is just as good at keeping their engine running smoothly as its more expensive counterparts. Proprietary technology protects against wear, deposits, and oil breakdown. 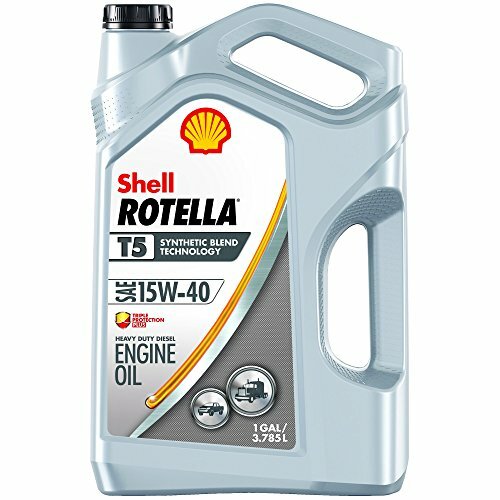 Shell Rotella T5 Synthetic Blend Diesel Motor Oil 15W-40 offers an excellent choice for those who are looking for a synthetic blend oil, and boasts a proprietary technology that helps to protect against engine wear, deposits, and oil breakdown. It controls engine wear 37% better than the maximum wear requirements in API CK-4 engine wear tests, and its new formula helps to deliver improved oxidation performance for increased resistance to breakdown under high temperatures. Those who purchased and reviewed this synthetic blend oil appreciated that it worked well even in high mileage vehicles, and was affordably priced. People said they noticed reduced blow by and less burning off when using this oil, and even found it broke down slower compared to conventional oils. At a cost of about $18/gallon, it’s pretty affordable, and the quality craftsmanship associated with the brand, as well as the ease of use more than justifies that price. It has a rating of 4.5 on Amazon with more than 100 people reviewing it, which we think goes a long way in convincing vehicle owners to make the investment. Decreases engine deposit formation to help maximize engine response. 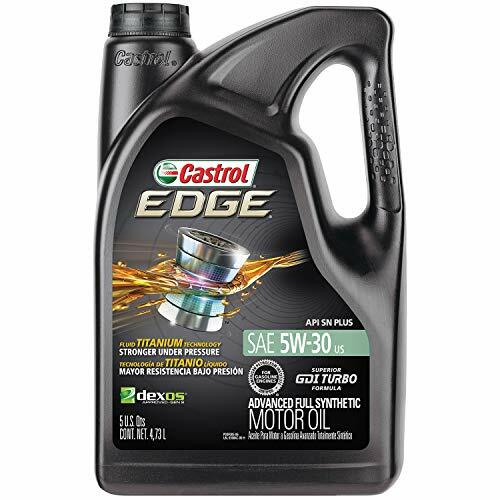 Castrol 03084 EDGE 5W-30 Advanced Full Synthetic Motor Oil is an excellent choice for those looking for a full synthetic oil. It works to help decrease engine deposit formation in order to help maximize engine response. It features fluid Titanium technology for maximum engine performance, and helps to reduce metal-to-metal contact across a range of driving speeds. Even under extreme pressure, it still protects the engine between drain intervals, and meets the strict requirements of several different vehicle manufacturers. Those who purchased and reviewed this synthetic oil appreciated that it helped to reduce engine noise, and was suitable for use in even high mileage vehicles. Reviewers claim that this oil lubricated better than others, and provided noticeable improvements in performance and fuel efficiency. With a price tag of around $25/5 quarts, it’s a pretty affordable choice, and the quality craftsmanship associated with the brand, as well as the ease of use more than justifies that price. It has a rating of 4.7 on Amazon with more than 200 people reviewing it, which we think goes a long way in convincing vehicle owners to make the investment. A synthetic oil is an essential choice for anyone whose vehicle owner’s manual requires the use of synthetic oil. Higher end, luxury cars often require full synthetic oil, and most car manufacturers nowadays recommend it anyways. If you don’t want to be performing oil changes as frequently, synthetic oil might also be a good choice for your vehicle. Synthetic oil can last anywhere from about 8,000-10,000 or more miles before needing changed, whereas conventional oils generally only last about 3,000-5,000 miles. That said, synthetic oil costs about two or three times as much as conventional oil, so can be an bit more of an investment. If you’re driving your vehicle in extreme temperatures or conditions, especially cold temperatures, a synthetic oil is a good choice as it helps to reduce cold starts and other performance issues. Synthetic oil is also a good choice for older vehicles, where engine wear and deposit buildup can become problematic. Finally, if you make plenty of short trips, conventional motor oil may not warm enough to burn off moisture and impurities, making synthetic the better choice for your vehicle. If you’re looking to replace your car’s battery or spark plugs along with your oil change, we have detailed shopping guides to help you find the best ones for your vehicle. Weight. Arguably the most important consideration when it comes to choosing the best synthetic oil is the weight. The weight of an oil is expressed using a numerical code system created by the Society of Automotive Engineers (SAE), and grades motor oils according to their viscosity. The higher the number, the thicker the oil is. Most oils have two number on them, the first is followed by a W (for winter) to indicate its viscosity in cold weather, while the second number indicates normal temperatures. You can check which weight oil your vehicle needs by referring to the owner’s manual. Additives. Many synthetic oils contain additional additives to help improve engine performance, as well as detergents to help clean the engine. If this is something that is important for you, compare different brands of oils to find the best one for your vehicle. Blends. If you prefer the higher performance of a synthetic oil, but just can’t stomach the price point, a synthetic blend offers a good compromise. They perform better than conventional oils, but don’t cost as much as a full synthetic. Keep in mind that they also won’t last as long as a pure synthetic oil. Size. Oils come in varying container sizes, from 1-quart – which are ideal for top-ups – to 5-quart or larger – suitable for complete changes. When purchasing synthetic oil for your vehicle, consider how much you’ll need. Your owner’s manual should have exact specifications. Price point. Finally, consider how much you are willing to spend on a synthetic oil. Synthetic oils vary in price from $20-$50 or more per container. Synthetic oil is a motor oil made from synthetic materials. Whereas conventional motor oil is made from crude oil, synthetic is not. Synthetic oil is often used in vehicle engines instead of conventional oils, as it provides superior mechanical performance, increased gas mileage, and reduced engine wear at extreme temperatures. It works by lubricating your engine’s system as the vehicle is running. What is the difference between synthetic blend and full synthetic oil? The difference between synthetic blend and full synthetic oil is that full synthetic is made with 100% synthetic material, whereas synthetic blend uses a mix of both conventional and synthetic oils. Blends offer better performance than conventional oils, but don’t cost as much as a full synthetic. It is important to keep in mind that a synthetic blend won’t last as long as a pure synthetic oil. How long does full synthetic oil last? Full synthetic oil can last anywhere from about 8,000-10,000 or more miles before needing changed, whereas conventional oils generally only last about 3,000-5,000 miles. Some synthetic oils even claim to be able to go up to 20,000 miles between drain intervals. Is it ok to mix different brands of synthetic motor oil? It is perfectly fine to mix different brands of synthetic motor oil, and you can also safely mix conventional and full synthetic oils without problem. Since all synthetic oils are made in the same manner – just using different additives – it won’t affect your vehicle performance should you decide to mix different brands. We looked at 20 other synthetic oils. Even though they didn’t make our 5 best synthetic oils list, they’re the best of the rest and each is still a great option for your vehicle. The information you’ll need to compare each one is included with the listing. This full synthetic oil boasts a premium formula that provides protection even under extreme conditions, and helps to reduce metal-to-metal contact across a range of driving speeds. This full synthetic oil boasts high mileage protection that makes it suitable for use with engines with more than 75,000 miles on them, and is available in a variety of viscosities. This full synthetic oil is suitable for use with both gasoline and diesel engines, and boasts high temperature high shear stability and very low volatility. This full synthetic oil offers superior wear protection and helps to leave critical engine parts four times smoother. It helps to prevent harmful sludge build-up while maintaining fuel efficiency. This full synthetic oil provides superior corrosion and wear protection, while increasing fuel efficiency. Proprietary additive technologies help to optimize engine performance. This full synthetic oil boasts a unique formula that works to clean pistons, improve fuel economy, and protect horsepower while providing unsurpassed protection to other engine components. This full synthetic oil provides a high level of protection against wear, and is suitable for use with both gasoline and diesel engines. It can be used in extreme temperatures, and helps to prevent deposit buildup. This full synthetic oil provides protection for up to 15,000 miles, and is suitable for use with gasoline engines. Suitable for use in severe conditions, it helps to reduce metal-to-metal contact across a range of driving speeds. This full synthetic oil provides improved fuel efficiency, and is suitable for use in vehicles with heavy duty diesel engines. It contains proprietary additives that help to prolong engine life. This full synthetic oil is suitable for use with gasoline engines, and helps to maximize fuel economy while protecting engine components by combining synthetic base oils with advanced proprietary additives. This synthetic blend oil boasts a low-smoke formula that has been specially designed to prevent carbon deposits to the piston rings, skirt, crown and under crown areas. This synthetic blend oil combines synthetic base oils with advanced proprietary additives in order to help maximize fuel economy while protecting engine components. This synthetic blend oil boasts a high mileage formula that is suitable for use with vehicles with more than 75,000 miles on them, and helps to prevent emission system failure. This synthetic blend oil boasts a blend of premium synthetic and conventional base oils combined with advanced additive technology to help protect your engine longer while improving performance and fuel efficiency. This synthetic blend oil is ideal for use in high mileage applications, for vehicles with over 75,000 miles. It helps to reduce low speed pre-ignition and friction, and minimizes exhaust emissions. This synthetic blend oil provides enhanced protection in all driving conditions, and boasts an exclusive Liquid Titanium additive which helps to protect against engine wear. This synthetic blend oil boasts a high mileage formula that is suitable for use in vehicles with more than 75,000 miles on them, and features easy-pour packaging to help prevent spills. This synthetic blend oil has been specifically formulated for Honda ultra fuel efficient vehicles, and offers protection from corrosion while reducing engine wear and sludge buildup.